Spyro looks like a little kid here, I know he is supposed to be a kid but here he looks really young, he's so cute, I like it! Hello Gabriele! 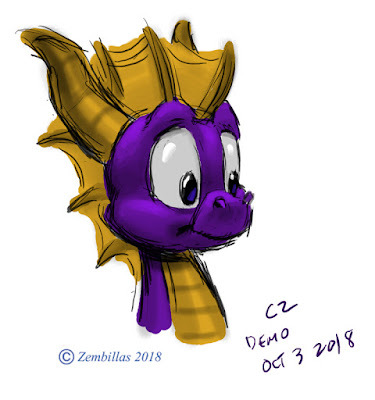 Spyro was originally intended to be a little kid and I see him that way for the most part. This was also inspired by a Spyro toy someone gave me me last week. The toy shows him even younger than what he looks like here! That played into the way I portrayed him. The coloring technique is very simple and I often use it to help students develop different approaches to digital rendering. That must be a cute toy then! I always saw Spyro as a teenager, for the voice and behavior in the games. A little question: Was this done in Photoshop? It was Photoshop and yes the toy was very cute. Big head / small body. Even cuter than the way I portrayed Spyro here. Almost like a baby. A fan brought a couple of them over plus some t-shirts and even a Spyro diary for me to autograph. She purchased them at GameStop. The Spyro franchise seems to be very robust. So cute. I was wondering about how you would feel if cynder becomes canon in the main Spyro series? She doesn't look like she could fit in the STD universe. But it would be interesting if you can somehow design her in a way that would make her look like she belongs to the OG Spyro universe. Some fans have taken the classic style and try to make it work. But it would be nice to see how you would design her if given the chance? Hi there Nitwit's World. That's a great idea! I'll give it a try.